Origin:	This variety has existed in Portugal for a long time under different synonyms. The primary name for this variety could only be determined recently with any degree of clarity. The variety appears in the literature in the second half of the 19th century, with mentions by F. Lapa, Vila Maior (1875) and Cinicinnato (1900), at which time it was cultivated almost all over the country under different names. Nothing is known about its origin. Count Odart (1874) held that this variety was identical to the Vennentino (IT) or the Malvoisie à Gros Grain (FR). Chief areas of distribution:	Alentejo. Official synonym(s) (national and OIV):	Roupeiro. The OIV lists Roupeiro de Alcobaça, Roussna (F), Trebbiano de Toscana (IT). Historic and regional synonyms:	Alvadourão (Dão), Roupeiro Cachudo, Roupeiro (Alentejo), Crato Branco (Algarve), Alvadurão (Dão), Malvasia Grossa, Códega (Douro), Alva (Cova da Beira, Portalegre), Dona Branca (Bucelas). Homonym(s):	Roupeiro Branco, Nº 256. Area under cultivation:	11,700 ha. Availability of propagating material:	RNSV polyclonal material, and RNSV certified clones 70 – 75 available. DOC quality wine:	Porto, Douro, Távora-Varosa, Beira Interior, Ribatejo, Palmela, all sub-regions of the Alentejo, Lagos, Portimão, Lagoa, Tavira. IPR quality wine:	Chaves, Valpaços. Regional wine:	Trás-os-Montes, the Beiras in the sub-regions of the Beira Alta; the Estremadura, Ribatejano, Terras do Sado, Alentejano, and Algarve. Young shoot (form of tip):	Open, with general strong anthocyanin colouration, hairs of medium density. Young leaf:	Yellowish green with crimson red edge. Very dense hairs on ventral side. Young shoot:	Green buds, nodes, and internodes. Short tendrils. Mature leaf:	Medium size, pentagonal, five lobes, medium green blade, profile of blade irregular, slight blistering on upper side of blade; blade undulate at base of petiole, convex teeth. Open V-shaped petiolar sinus, petiolar sinus limited by veins. Overlapping V-shaped upper lateral sinuses, medium prostrate hairs and erect hairs on lower side of blade. Bunch:	Medium to large, shouldered, conical; medium density. Short, half lignified peduncle. Berry:	Medium to large, uniform, ovate, green yellowish. Berry skin of medium thickness and medium frosting. Flesh colourless, very juicy. Short peduncle. Time of bud burst:	Normal, 5 days after the Fernão Pires. Flowering:	Normal: 4 days after the Fernão Pires. Berry (colour change):	Normal, 9 days after the Fernão Pires. Pruning weight::	3 - 4 t/ha. Tendency to form lateral shoots:	Medium. Yield:	Index 337. RNSV statistical value: 1.96 kg/vine (Average of at least 40 clones in Pinhel over 3 years). Yield consistency:	Initially high; reduces in subsequent years, thereafter, inconsistent. Winkler Index:	1 = 1.04; 2 =1.38; 3 =1.4 flowers per shoot. Sensitivity to abiotic factors:	Risk of bunches drying out. Susceptibility to fungal diseases:	Susceptible to Oidium and Botrytis, somewhat susceptible to Peronospora and Excoriosis (Phomopsis viticola Sacc.). Systemic viral infection prior to selection:	5% GLRaV-1, 40% GLRaV-3, 5% GLRaV-2 and -6, 35% GFkV, <50% RSPV. Susceptibility to Pests:	Susceptible to red spider mite. Vineyard conduction system:	Single or double Guyot, but adaptable to all types. Soil requirement:	Warm soils with slope (Douro). Climatic requirements:	For variety appropriate yields, vineyards should be located in a warm, moderate climate, particularly one without early rains in September. Rootstock:	Compatible with R110, R99, 196-17, SO4. Irrigation:	Of benefit, as long as it does not lead to excessive yield. Spoilage of mature berries:	Susceptible in September rain. Risk of bird damage:	Protection recommended. Hand harvest suitability:	Suitable, at lower temperatures. Wine type:	Table wine, brandy. Potential alcohol content:	Medium (12.5% Vol). RNSV statistical value: 11.83% vol. (Average of at least 40 clones in Estremoz over 4 years). Natural acidity of must:	Medium (4 -5). RNSV statistical value: 5.57 g/l (Average of at least 40 clones in Estremoz over 4 years). Risk of oxidation of must:	None. Colour intensity of wine:	Bright. Risk of oxidation of wine:	Medium, depending on vineyard location. Aromatic profile:	Total terpenoids, 114 μg/l (1997), 170 (1998); total benzenoids: 681 μg/l (1997), 828 μg/l (1998); total norisoprenoids 210 μg/l (1997), 406 μg/l (1998). Ageing Potential:	Normally not at all good, but depends on vineyard location. Blending recommendation:	Arinto, Antão Vaz, Sercial, Rabigato, Cerceal Branca. Wine Descriptors:	Wines produced have a citrine colour, and develop a very intense aroma, with notes of not quite ripe tropical fruits, and lemon. The taste is characterised by light acid, fruitiness and a marked youthfulness, especially on the palate (P. Laureano). 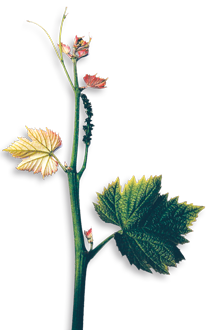 Wine quality:	The young Síria is a wine par excellence, as often mentioned in historical literature. As it matures, however, especially if from warmer regions, a sharp decline in its aromatic structure becomes evident. Variety Characteristics:	Very high yield variety with good viticultural properties, native to almost all regions in Portugal. It produces fruity wines which are ready to drink very soon after fermentation. 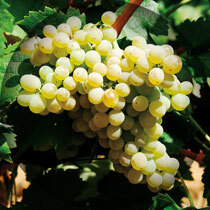 The best white wines from this variety are produced at high altitude, and enjoyed immense popularity in the 1980s, but lost prominence as a cultivar in regions at lower altitude such as the Ribatejo and Alentejo, because of limited vineyard longevity.